KIDS RULE NOW! - What is a KIDposium™? 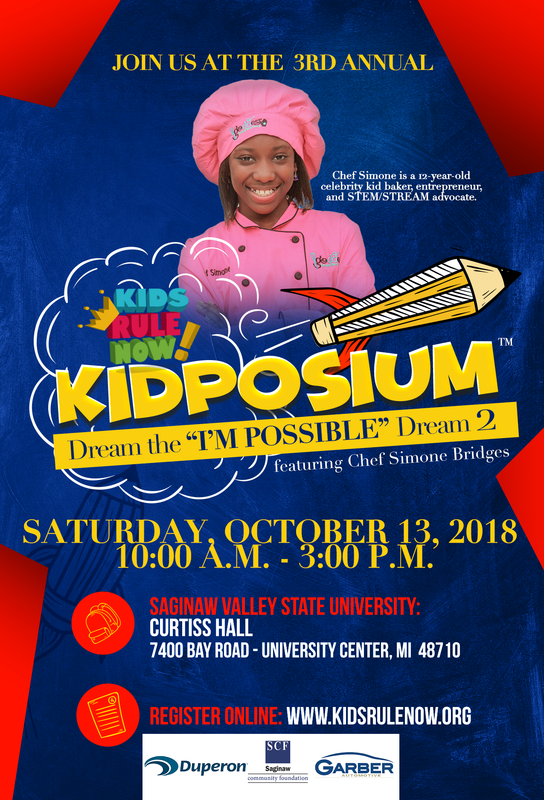 KIDposium™ is the children's conference created and hosted by Kids Rule Now! Inc. The vision for this event came about in 2015 and premiered in October of 2016. KIDposium™ is a word created exclusively for Kids Rule Now! Inc. use to describe our annual children's conference. Our KID-friendly, KID-focused, and KID-driven, event is specially designed for kids 2nd - 6th grade. We call it "The ORIGINAL conference for kids!" Kids are full of energy, creativity and have individual gifts. We provide a full-day conference experience to inspire and encourage kids to not only dream, but give them the motivation to go after their dreams. Our KIDposium™ Breakout Session Speakers are local entrepreneurs who are passionate about what they have accomplished in business, and understand the value of pouring into kids at a young age. Our Keynote Speaker Session is led by a KID entrepreneur who has his or her own successful business. Its exciting for kids to see an example of another kid that has dared to DREAM BIG and go after that DREAM. One great feature of the KIDposium™ is that parents are a part of this conference experience too. Kids must be accompanied by a parent/adult, but the kids have their very own separate sessions that have been designed just for them! This unique event is fun and inspiring for kids and adults, and includes sessions throughout the day, lunch, fun, prizes, great opportunities to make new friends and learn new skills!